Ha! Honeycomb might be designed by Google specifically for tablets, but it seems that Google has the Android Gingerbread interface hidden underneath as this hack easily turns your Honeycomb tablet into one running the Gingerbread UI. 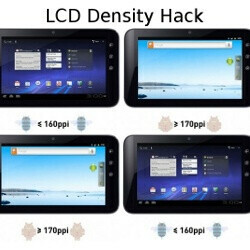 All that’s required is root access and an app allowing you to change the LCD Density setting (such as the recommended LCDDensity for Root), which seems to be the trigger feature for the interfaces. After getting root access, finding and changing the pixel density to 170 or higher and rebooting afterwards would take you to the Gingerbread UI, more common on phones. Reverting back to Honeycomb is as easy as editing the pixels per inch to 160 or less and reboot the device. After all, it seems that Google might have not exactly taken a ground-up approach when building its tablet-optimized user interface, doesn’t it? Check out the video demonstration below for yourself and don’t hesitate let us know which one you prefer and why. there are already plenty of roms out there that integrate looks and other things from the honeycomb OS. kind of interesting though. Makes me wonder if Honeycomb is just a highly specialized launcher now. Also, it looks like this is a hacked honeycomb rom running on top of FROYO. Dell streak 7 ships with a Froyo, remember? The notification bar proves that its froyo not gingerbread. Google is definately not to be blamed.